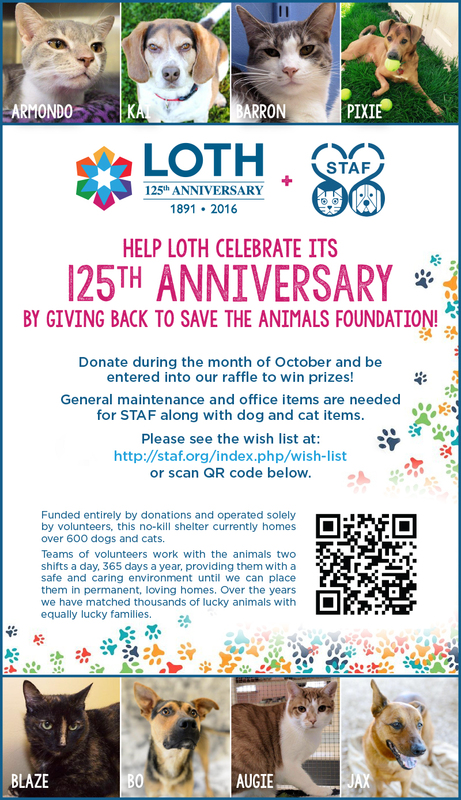 October - Save The Animals Foundation - LOTH, Inc.
We are donating our time to volunteer and our resources to gather supplies for the Save The Animal Foundation (STAF) in Cincinnati. Funded entirely by donations and operated solely by volunteers, their no-kill shelter currently homes over 600 dogs and cats, many of whom have been abused, abandoned or literally tossed away. LOTH plans to donate over 125 supplies from our Columbus and Cincinnati locations and hopes help to save countless paws!